Apeaksoft Free Online Video Converter is a simple and handy video converting tool. It can convert any video/audio file to MP4, AVI, MOV, MP3, GIF, etc. It also has a lot of powerful video/ audio settings functions to enhance video/audio by upscaling video resolution, choosing higher video/audio bitrate. What’s more, it will bring you a wonderful experience of converting 1080p HD videos. Apart from video converting functions, it also can be used as a video to GIF converter. Key Functions 1.Converter any video/audio to other format This software could converter video files to other formats, such as MP4, MOV, MKV, AVI, M4V, FLV, WMV, VOB, MPG, 3GP, GIF, etc. In addition, it could also converter audio files to MP3, AAC, AC3, WMA, WAV, etc. It also allows you to convert video to audio format, for example, concerting MOV to MP3, etc. In addition, it also could do the batch conversion at one time beyond your imagination. 2.Powerful profile settings function With this powerful free online video converter, you will have no problem in making various settings for your video/ audio even though you are a novice. You can use it to upscale video to higher resolution, set higher sample rate or bitrate for your audio, etc. 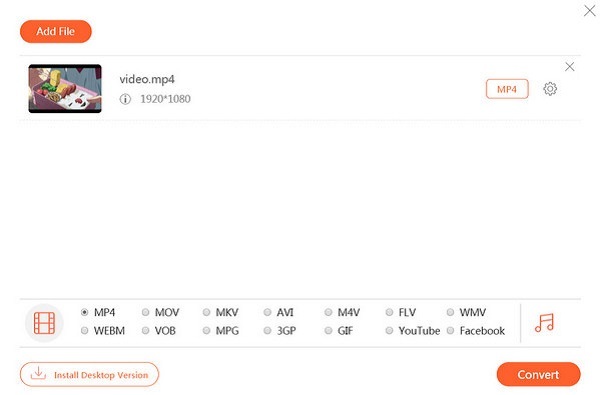 3.Fast conversion speed and super-high quality With advanced technology, Apeaksoft Free Online Video Converter has amazing fast converting speed, the conversion process will be completed when you enjoy a song. The most important thing is it has the ability to convert video/ audio with zero-quality loss. 4.Support both Windows and Mac, no file size limit It is really magical software with no requirement on system or browser. So you could use it both on your Windows and Mac. And please don’t worry about your large-size files, it has no limit to your file size. You can convert as much as you want.